Wine dinners are the perfect way to have some fun with friends or have a special night out with a loved one. Lucky for you there are two upcoming wine dinners at the Seminole Hard Rock Hotel and Casino this month. 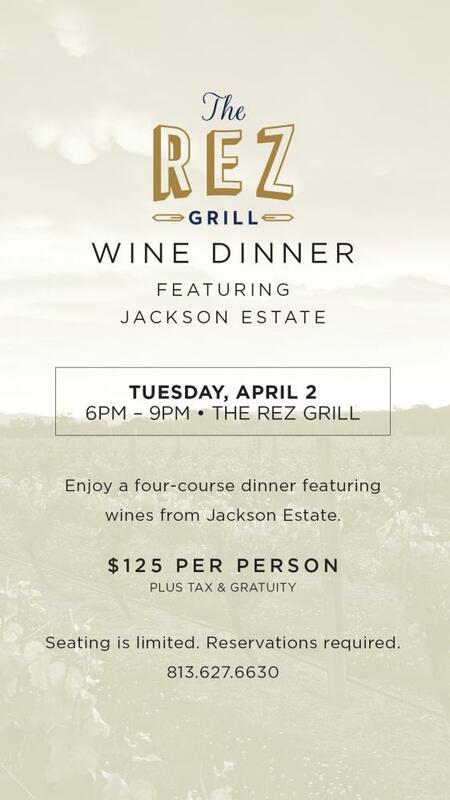 The Rez Grill Wine Dinner featuring Jackson Estate can offer you a creative four-course meal paired with coastal California wine tomorrow Tuesday, April 2nd at 6 p.m. Join creative culinary director Frank Anderson and Chef de Cuisine, Francisco Pomalaza tomorrow for this exclusive event including sea bass, short rib, and most importantly Jackson Estate wine. The event is $125 per person (plus tax and gratuity) and reservations are required. Check out the full menu for details. This is not an event you'll want to miss! For reservations for Tuesday’s April 2nd event at The Rez Grill call Customer Care at (813) 627-6630 or The Rez Grill host stand (813) 627-8120. Space is limited so call today! Can’t make it? Want to do it again?! 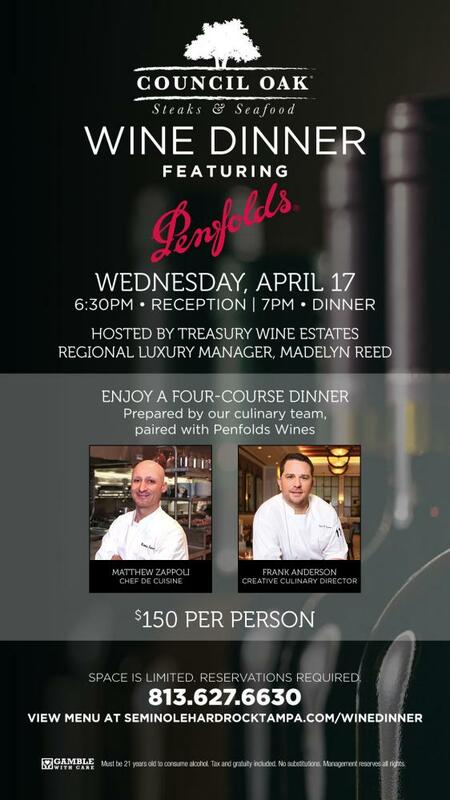 Wednesday, April 17th join Council Oak Steaks and Seafood for their wine dinner featuring world famous Australian winery Penfolds. This event will be hosted by Treasury Wine Estates regional luxury manager, Madelyn Reed. A cocktail reception will begin at 6:30 pm and be followed at 7 pm by an exquisite dinner prepared by creative culinary director Frank Anderson and Chef de Cuisine, Matthew Zappoli. The event is $150 per person (includes tax and gratuity) and you can check out the full menu for details. This will be an unforgettable night you do not want to miss! For reservation for Council Oak Steaks and Seafood Wine Dinner on April 17th, 2019 call Customer Care at (813) 627-6630. Both events are located in the Seminole Hard Rock Hotel and Casino at 5223 Orient Road in Tampa. Stay connected with other restaurant events in Tampa Bay by connecting with 813area. We cover all of the things to do in Tampa Bay. Best of all, it's free!